The name Lawang sewu means Thousand Doors, but among the local Javanese the name conotates an eerie haunted house with a tragic history. The Dutch built it in 1863 by C. Citroen. It was the branch office for the Dutch Indonesian train company but when the Japanese invaded in 1942, they used it as a gruesome interrogation headquarter where they jailed and killed a lot of Indonesians. Which will add to ghost stories that has been told for generations. Long standing reports of multiple ghost sightings in this building has turned it into a local destination for young students & tourists who would make their visit on weekend nights to experience this legendary haunted house. This include a reality show called " Dunia Lain" (The Other World) that was aired some years ago in our local station. Architecturally though, this building is very pretty. Stained glass stands in the main stair void is one of the masterpieces that equivalent to those you see at Notredamm in Paris. The main reason that is hasn't been thorned down was probably the high budget beside our architecture preservation and hertigae law. It is such a shame that this old building does not hold other function. It sure could be of use for events and also movies settings, but no regular happenings is occured. When you seek other kind of adventure do peep in the underground, they also prepared equipment to those curious to see the "other world". The possibility to meet one of its creature is definetelly high! Don't say I didn't warn you! 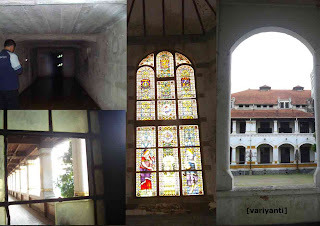 This video below is one of the ghost that has been captured on Lawang Sewu at Dunia Lain, a TV program. Get DISCOUNTED PRICE HOTELS IN SEMARANG Here!